It’s winter time and the nights are getting longer and chillier. In times like this, a normal blanket may not be enough to keep you warm and toasty. 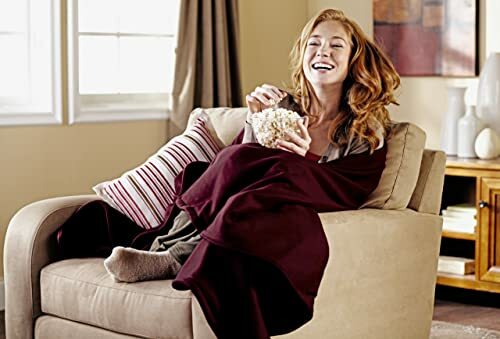 Invest in an electric blanket without heaping extra blanket layers for a warm and cozy night. These days, there are many electric blanket variations out there, from under-blankets, throws to duvets. There’s bound to be one that will cater to your needs. Just plug in the connecting electrical wire to the nearest socket and you’ll have a heated blanket to keep you warm through the night. With the best electric blankets 2019, you don’t have to worry about your utility bills during the winter months. Instead of having your heater or bedroom thermostat turned up all night long, you can just plug in your electric blanket. It’s always a good practice to consider your priorities before making any purchase. The same goes for choosing the best electric blankets 2019. Where Will You Be Using The Electric Blanket? If you’re buying the electric blanket for your bedroom, makes sure that it is a good fit for your bed. The last thing you want is to buy an electric blanket that is too small for your king-sized bed. Neither do you want an oversized electric blanket that ends up touching the bedroom floor. If you intend to buy an electric blanket as a throw blanket for your living room couch, there are many great electric blankets in the market that are designed as throw blankets. Be sure to check that the dimensions of the throw blankets would fit your sofa or couch. Aesthetics wise, you may also want to consider getting an electric blanket that matches the color, design and texture of your bed or your couch. How Quickly Do You Need the Electric Blanket To Heat Up? Today, there are a number of electric blankets that come with pre-heat and hold features, so that you can have a warm and toasty bed ready for a good night’s sleep. If you are the forgetful sort when it comes to switching on your electric blanket, this can be a really handy feature for you. Are You Sharing The Electric Blanket With Someone Else? Maybe you intend to share the electric blanket with a partner. Or perhaps this is an electric blanket that’s meant for guests in the guest bedroom or the living room couch. Whatever the reasons, if the electric blanket is meant for sharing, you may want to consider getting one that comes with different heat settings that can be adjusted to the user’s preference. Better still, an electric blanket that has dual controllers means that you can share the electric blanket with your partner and have your side of the blanket adjusted to your preferred temperature setting. Is The Electric Blanket Safe? As with all wired products, we don’t want an electric blanket that ends up giving us an unpleasant or deadly electric shock. Safety is definitely an important consideration when it comes to choosing the best electric blankets 2019. All electric blankets sold in the United States are required to meet the UL 967 standards which is the safety code that governs electric blankets and mattress pads. Look out for safety features such as a low-voltage system as well as automatic shut-off sensors which prevent overheating. Is The Electric Blanket Comfortable? The power cords, connectors and controllers may feel uncomfortable for some users. Thankfully, the best electric blankets 2019 these days have come up with new designs to minimize the discomfort caused by these items. There are electric blankets that are fitted with ultra-thin wires that are barely noticeable. To increase your comfort level, you can also consider slipping the electric blanket into your own duvet. If you are shopping online, your best bet will be to check out the customer reviews to see if there are any complaints in terms of the placement of the wires, connectors and controllers for the electric blanket. Is The Electric Blanket Easy To Operate? Nobody wants an electric blanket that is difficult to operate, especially at night when all you want is to go to bed. The best electric blankets 2019 come with user-friendly controls for you to adjust the temperature settings and other settings hassle-free. Some even come with controls that are backlit so you can easily locate the control button you want even when your lights are off. In terms of the power cord, a longer power cord makes it easier for you to snuggle up to your electric blanket without having to worry about your cord getting tangled up or pulled off the plug. Is The Electric Blanket Machine-Washable? Because of the electrical components, electric blankets can be difficult to maintain. However, these days, most electric blankets can be machine-washed. Some can only be air dried, but recently, more and more electric blankets are now designed to be able to go through the dryer, making it all the more convenient to keep your electric blanket clean. What Is The Warranty For The Electric Blanket? The best electric blankets typically come with a warranty of five years. Electric blankets are costlier than your usual blanket, so you should definitely get an electric blanket that comes with at least a one-year manufacturer’s warranty. Without further ado, here’s our list of the top five best electric blankets 2019. If you’re looking for a heated throw blanket that will do the job for your couch, the Sunbeam Reversible Heated Throw would be the perfect choice. 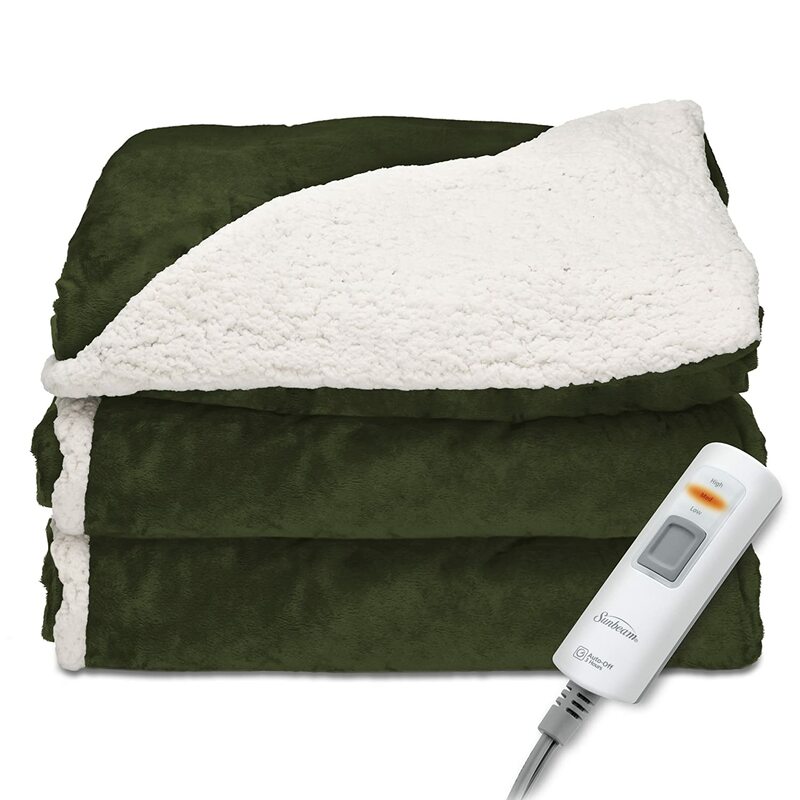 For a price just below $60, you get a heated electric blanket that is 100 percent polyester and reversible-one side has a sherpa lining (with a 250 GSM rating) and the other side is a royal mink fabric (with a 200 GSM rating). The Sunbeam Reversible Heated Throw is equipped with three different heat settings and a three-hour auto shut-off function. While the number of heat settings is fewer than other more expensive electric blankets, many customers who reviewed the Sunbeam Reversible have few complaints about its heat settings. In fact, close to 90% of Amazon customers have praised the Sunbeam Reversible for its quality and softness. What’s convenient about this electric blanket is that it is also machine washable and dryer safe. Some minor complaints about this electric blanket would be its size (it’s 50 by 60 inches, which might be an issue for someone who’s tall or if you intend to fit it on a queen-sized or larger-sized bed) and the length of the power cord (some have remarked that Sunbeam could have been more generous with the power cord which is only 6ft long). That said, this is still a great deal for an affordable electric blanket that also happens to come with a five-year warranty. Sounds like a great deal? With the Sunbeam Reversible selling out fast on Amazon, it would seem that many others agree with our assessment that this is the best electric blanket 2019 if you’re looking for a basic heated throw blanket for your couch. 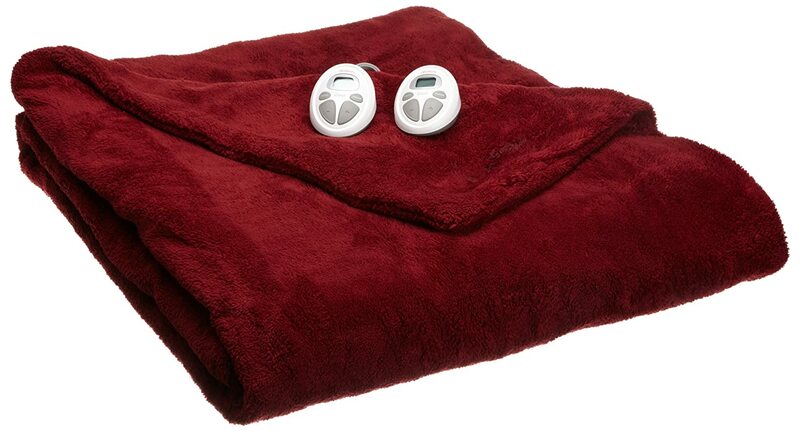 This electric blanket is available in four different colors: garnet red, honey, olive green and sable. So, take your pick before Amazon runs out of stock! For almost the same price as the Sunbeam Reversible Throw, you can get the Biddeford Micro Mink/Sherpa Electric Heated Throw. It comes with six different heat settings for you to choose from (twice the number of settings of the Sunbeam Reversible Throw) and a longer power cord (13ft long as opposed to the 6ft-long power cord for the Sunbeam Reversible Throw). You can also get this electric blanket at a slightly larger size (50 by 62 inches) in sage color. The Biddeford Micro Mink/Sherpa Electric Heated Throw is made from 100% polyester fabric and boasts of ultra-thin wires. Many Amazon customers have said that they were able to slip under the blanket comfortably without feeling much of the wires. For all its pluses, however, a number of customers have remarked that the connection between the controller and the electric blanket is fuzzy and they had the bad experience of having to restart and replug the blanket several times before it could work properly. This electric blanket comes with a five-year warranty, but some Amazon reviews mentioned difficulties when claiming compensation or a replacement for defective products. There are not too many negative reviews, but this is still something that you should keep in mind. It might be a good idea to check out the most recent reviews to see if there is any batch problem. From the recent reviews, it appears that most customers who purchased this electric blanket recently were pretty satisfied with their purchase. For a luxury option when it comes to a heated electric throw blanket, we would still say that the Biddeford Micro Mink/Sherpa Electric Heated Throw is the best electric blanket 2019 out there, based on its product specifications and generally positive reviews on Amazon. Want an electric blanket that allows you and your partner to sleep at your respective preferred heat settings? 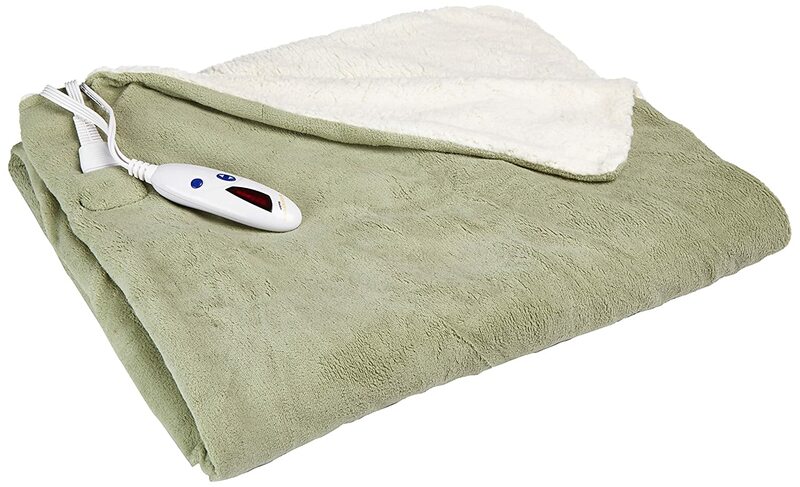 The Soft Heat Luxury Micro-Fleece Electric Blanket might just be what you’ve been looking for. 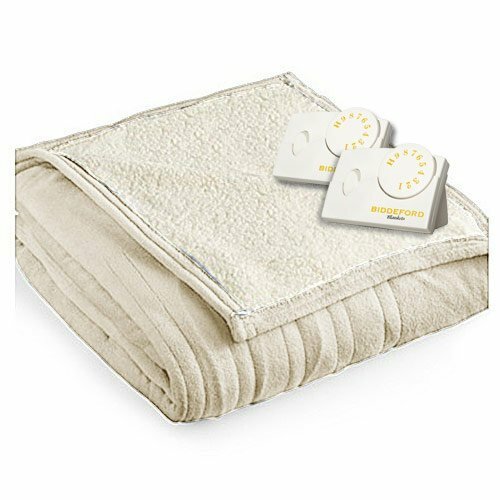 This electric blanket comes with Soft Heat’s signature zoned heating technology with easy-to-use controllers included if you select a queen-sized, king-sized or California king-sized blanket. The blanket is divided into two zones so you can adjust your side of the blanket to suit your own preferences, without sacrificing the preferences of your partner. This electric blanket also comes with a pre-heat feature so you can keep your bed warm even before you get into bed. With its super-soft 100 percent polyester micro-fleece fabric, you can be assured that the Soft Heat electric blanket will provide you all the comfort you need when snuggling up in bed. In fact, it’s so comfortable that many customers said that they don’t feel the wires at all. This electric blanket is also machine-washable (on a gentle cycle) and dryer safe. Its low-voltage system not only helps to save energy, but also makes this a safer electric blanket for using. Other energy-saving features include its auto shut-off function after 10 hours should you forget to switch it off. There are five colors to select from: beige, chocolate, gray, natural and slate blue. For a queen-sized version of this blanket, it usually costs just below $200, which is quite a hefty investment for a blanket. That said, with close to 2,000 Amazon customers giving it 4-star or 5-star ratings, it seems that this electric blanket is really worth the buck. While some customers have complained about the product getting defective, you can take comfort in its five-year warranty. What’s more, Amazon is having a promotion for this Soft Heat electric blanket, with over $100 worth of savings. So, don’t miss out on this great offer for the best electric blanket 2019 to share with your partner! Biddeford is another reliable brand if you’re looking for the best electric blankets 2019. For under $100, you can get a queen-sized Biddeford MicroPlush Sherpa Electric Blanket to keep you warm and toasty when it gets chilly. The fabric is 100% polyester, with a microplush top and a sherpa lining for the bottom. What’s more, you also get an electric blanket that comes with 10 different heat settings so you can customize the temperature that you want. If you’re sharing the blanket with someone else, the queen-sized Biddeford MicroPlush Sherpa comes with two controllers so you can choose your desired temperature setting. Amazon customers have also commented that the ultra-thin wires make this electric blanket very comfortable to sleep in or snuggle in. For your convenience, this electric blanket is also machine-washable. Another plus point is its extra-long power cord so you don’t have to worry about the blanket getting unplugged when you toss and turn in bed. The only downside is that it is not dryer safe, so you will need to have it air dried. Another small minus is that it comes with limited color options: linen or cloud blue. With a five-year warranty, this electric blanket is a steal for its affordability with so many cool functions. This is the best electric blanket 2019 for your buck if you’re not too upset about the limited color options and the fact that it cannot be put through a dryer. For an upscale electric blanket with the highest softness rating, look no further from the Sunbeam LoftTech Heated Blanket. There’s a reason why a queen-sized version of this electric blanket costs close to $160-it’s made from 100% polyester fabric that boasts of a 200 GSM rating on each side of the blanket with a plushness of 8mm. Melt into this electric blanket for a good night’s sleep or a snuggle on a cold chilly night. Like the other Sunbeam electric blanket, the Sunbeam LoftTech comes with many features that are a signature trademark of Sunbeam. Choose from any of the 10 heat settings that come with this electric blanket. It also comes with a pre-heat function, a 10-hour auto shut-off function for energy saving and safety purposes. The controller is very user-friendly and even comes with a LCD display that is backlit, so you don’t have to fumble for your nightlight if you want to adjust the settings in the dark. The wiring system in the electric blanket is done such that you won’t even feel the wires under the blanket. This blanket is also machine-washable and dryer safe. Majority of the customers who have reviewed the Sunbeam LoftTech have nothing but rave reviews about it being a soft, warm and fuzzy electric blanket that keeps them toasty in cold winter nights. Like all other Sunbeam electric blankets, the Sunbeam LoftTech comes with a five-year warranty. 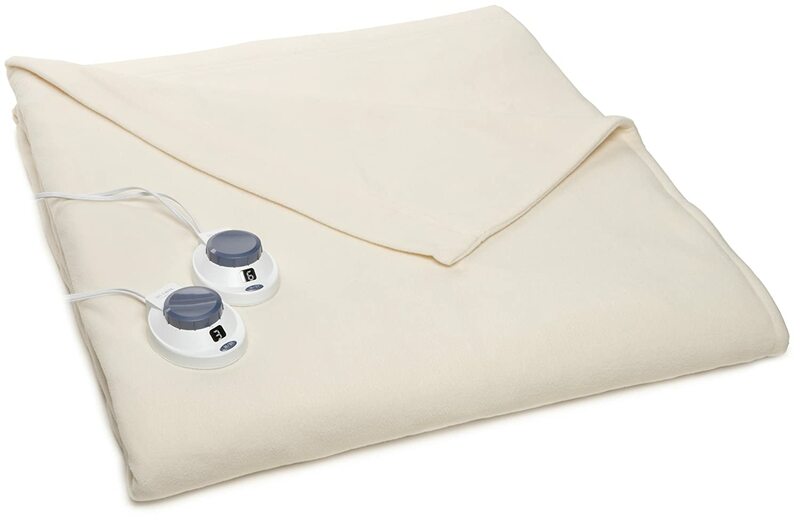 This electric blanket is selling fast on Amazon right now- for a queen-sized blanket, only two out of the three colors (walnut brown and garnet red) are still available with limited stock. If you want the softest electric blanket available in the market, this is the one that you should definitely consider! Now that you’ve gone through our list of the top five best electric blankets 2019, we hope that this will be a great start to your own research when hunting for the best electric blankets to meet your needs. For those who are not living in the Southern Hemisphere, we know that it’s summer now and winter is still months away! We hope that this will still be a good read for you to stay informed, so that you know what to look out for when winter is approaching. Happy shopping everyone!